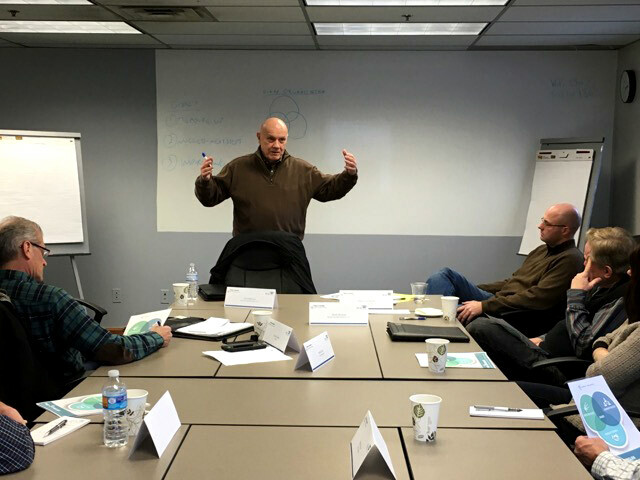 In addition to our signature 2-on-1 coaching model, Maximum Value Partners also offers Group Coaching for small business owners who prefer a group setting with a handful of peer business owners like themselves in addition to two business coaches. MVP utilizes the same 3 Circles and 7 Keys framework to help drive the success of the Group Coaching participants and to ensure each of the participants is able to clearly communicate and understand each other’s business opportunities and challenges. Due to the nature of groups, MVP’s Group Coaching Services tend to be a bit more structured than our 2-on-1 coaching model. The group meets every other week and the first several months are centered around taking measure of and introducing the 7 Keys to Success into each business. After the initial several months, the participants are able to focus on which of their 7 Keys need the most attention. Unlike the 2-on-1 coaching, the Group bi-weekly meetings aren’t as focused on the detailed steps of how to get from here to there, but instead rely more on the owner’s ability to execute and implement the 7 Keys. Business owners who join a group also have the benefit of being able to tap into their fellow group members for guidance and support in between the bi-weekly sessions. While the improvements to the business and business owner typically take more time in a group than in the 2-on-1 setting, many business owners like the groups as an initial foray into being coached in a less intense fashion than the 2-on-1 approach. Many owners also enjoy the social aspect and networking opportunities that result from being part of a close group.